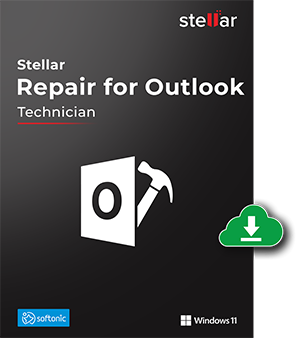 Stellar Repair for Outlook Technician is an advanced PST repair software that not just repairs corrupt PST files but compacts and splits large, oversized PST files. After repair, you can save the entire mailbox in a new, usable PST file and import it to Microsoft Outlook. I used this software to remove corruption from my PST. It not just repaired my corrupt Outlook PST file but also reduces the size of PST file by Splitting & Compacting. It's a boon for Outlook users as it not only repairs my corrupt Outlook PST file in a smooth manner but also recovered my accidentally deleted mail from my mailbox too. Stellar Repair for Outlook Technician fixes minor as well as significant PST file corruption issues. Irrespective of the severity of damage, the proficient tool repairs PST files in a short span and facilitates recovery of all mailbox data. Additionally, if you’re not aware of the PST file location on the system, you can find PST through the ‘Find’ button. Moreover, you can easily recover accidentally deleted data from the Outlook’s ‘Deleted Items’ folder. This Outlook PST Repair software lets you export the recovered data in Microsoft Office 365 and also provides option to save in other file formats. These are PST, MSG, EML, RTF, HTML, PDF, DBX, and MBOX. While other options directly save data in the selected format; for Office 365, you can export repaired files to Office 365 account by entering valid login credentials. If you do not wish to compress the PST but still want to reduce its size in order to avoid chances of it becoming further corrupt, Outlook recovery software lets you split the repaired Outlook PST into two or more smaller units and save them on the disk. Moreover, this feature lets you split the PST according to mail IDs, date or size..
Splitting according to date will create a single PST file which will have data as per the criteria selected by you. Outlook repair tool gives you four Calendar options to work with – Day, Work Week, Week, and Month. The ‘Day’ option lists all the entries on a particular day from the list of the scanned emails. The ‘Work Week’ option lists all the entries about a workweek (from Monday to Friday). The ‘Week’ option lists all the entries about a week (from Monday to Sunday). The ‘Month’ option lists all the entries of a particular month. Unlike other Outlook recovery software, Stellar lets you recover lost or deleted Contacts from PST. Once the scanning completes, the contacts of the user mailbox can be previewed by clicking the "Contacts" option from the bottom left of the interface. You can import the contacts along with the repaired Outlook file. The contacts in the Personal Address Book (PAB) need to be imported manually. Users have the option to save and load scan information easily with this software that is devised to repair Outlook files. To do so, users should use ‘Save Scan Info’ and ‘Load Scan Info’ feature respectively. With this, users can reduce the time taken to repair damaged PST files and successfully recover the data items. This is because users do not have to scan the corrupt PST file again. This Outlook data file repair software gives users the option to view and save the log report of the entire PST file repair process to the desired location. Choose ‘Log Report’ from the ‘View’ menu and then click on ‘Save Log’ in Outlook Repair software dialog box to save the log report. Once saved, users can use it to analyze the PST file repair Outlook process. In a unique bid, Outlook recovery software lets you save the repaired Outlook PST with specific details like email subject, email date, etc. using the Naming Convention option. You can also use a combination of the email subject and date to save the PST at a desired location on the disk. The look-and-feel of the product matches that of MS Office 2007 thus allowing users to adapt to it more comfortably. Additionally, it can be used with a variety of MS Outlook versions including Outlook 2019, 2016, 2013, 2010, 2007, 2003, 2002, 2000, and 98. I have repaired the corrupt PST file, but unable to open it in my Outlook. Please guide how to resolve the issue. We suggest you to follow the steps below to resolve the issue. Double click 'Mail'. Select 'E-mail Accounts' to configure your email account in 'Mail Setup' dialog box. Now you have two options to view the repaired PST file. Either select 'Open > Outlook Data File' from 'File Menu' or, import the repaired PST file to MS Outlook. What does the free demo version of the 'Technician' edition do? The demo version is a free evaluation of the software. You can repair Outlook corrupt PST file, preview all the emails and other items after repair. However, to save the repaired file, compress or split the PST file, you need to buy the full version. I have repaired the corrupt PST file. Can I preview the Tasks, Notes, and Journals? Yes, you can preview all the Tasks saved by the user in the mailbox. The software provides the 'Task' option on the bottom left of the interface. Once you click the 'Task' option, all the tasks along with the subject and due date will get listed. This helps in easy search for a particular task. The list also has an option to search for a particular task, either by subject or by due date, if the list is very long. Note:This option is just below the Events option on the bottom left of the interface. The option lists all the notes saved by the user. Journals - You can select the "Journal" option from the interface. This will list all the journals with their subject and due date. You can select and preview any desired journal based on the subject. The list also has an option to search for a particular journal, either by subject or by start date, if the list is very long. I used the demo version and scanned my corrupt PST file. It is showing my lost mails. Do I have to scan the corrupt PST again, if I purchase or register the tool? No, you don't have to rescan the corrupt PST file after registering the software. You can directly save the PST that is already repaired with the Demo version of the software. Can I repair Outlook emails on Windows 10 (64-bit) PC? Yes! You can repair Outlook components (emails, contacts, calendars etc.) on the latest Windows 10 (64/32 bit) PC without any trouble.